Metallic business cards make eye-catching conversation starters with their reflective ink. Attention-grabbing marketing pieces like metallic business cards help clients and customers easily recall the interaction you’ve had with them. Spot UV is a special coating applied to a specific area to add shine and texture. It blends well with metallic ink. Use spot UV to bring attention to business logos or product information. 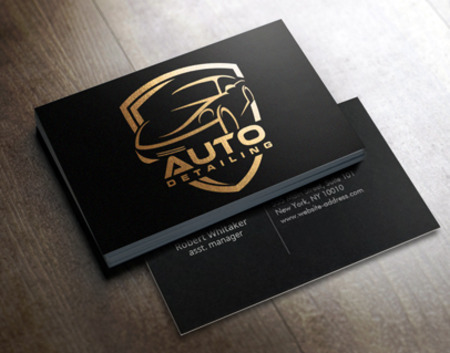 Metallic business cards are best used for designs that feature lots of contrasting colors. Text tends to stand out more. And unlike foil stamping, metallic ink can work on most colors, even on color gradients. It’s the right choice for graphic designers. Metallic business card printing gives them the chance to showcase their work. Is the file set up process the same as regular business cards? Yes, it is. If you need help setting up your file, call us. What’s the difference between foil stamping and metallic ink printing? Foil stamping is only available in 3 colors: copper, silver, and gold. Metallic ink printing can be used on a wide range of hues. What’s the standard business card size? The standard business card size is 3.5” x 2” which is also our most popular size option. What’s special about your 16 pt. cardstock? Our premium 16 pt. cardstock does not easily bend and has some noticeable heft to it. To make designing and printing your metallic business card online easier, PrintPlace.com offers layout templates.These templates provide you with the right specifications to ensure your design is printed correctly. Download one of the formats below to start. Metallic business card printing is not for the faint of heart. Metallic inks make colors bolder, making them ideal for businesses and professionals looking to make a statement. Add Spot UV – With Spot UV, you can shift your customer’s focus to specific areas of your artwork like your logo and text. It adds extra shine and texture to make your cards stand out further. Use Rounded Corners – Use rounded corners to literally take the edge off your cards. This makes them fit comfortably in your pocket and will less likely damage your wallet. Choose Clashing Colors – To see the full effect of metallic inks, it’s best you use contrasting colors. Darker colors, while still noticeable, won’t stand out as much. Have Fun With Text – Use bigger fonts. Metallic ink goes well with typography.